Algonkian Elementary School is putting on the 3nd annual ALG Rough and Tumble to raise money for Autism Awareness! ALL proceeds go to Algonkian Elementary's Special Education Programs. We will be staggering the races, starting with 5th graders at 10:00am, and all other grades will follow. Parents are encouraged to participate with their children and are welcome to run the course during their children's allocated race times. Choose your Charity or local PTA! A portion of proceeds will go to the non-profit/school of your choice! This race is 95% on paved and shaded trails! It starts in down town Herndon, at Old Town Hall (@ Station St, Herndon, VA 20170). The HerndonHalf is a there and back again race. First traveling up the W&OD trail, then the race goes along a short portion of Herndon Parkway and up Folly Lick Trail, across into Sugarland Run Trail and then back the way you came. Friday, September 20th (from 12pm - 7pm) at the Road Runner Sports Sterling Store. *PLEASE BE AWARE THAT THE HALF TRAIL CROSSES OVER A STREAM IN SEVERAL LOCATIONS USING PYLONS (high clearance strollers recommended). Some proceeds will go to the non-profit/school of your choice! Friday, October 11th (from 12pm - 7pm) at the Road Runner Sports Sterling Store. Choose your Charity or local PTA! ODR will be raffling away great prizes including (not limited to) a Garmin Watch and the chance to get free registrations to all our races in 2020! The Virginia Marathon is currently being designed and more information will be posted as we establish the route, times, and other details. More than likely it will be a trail run and will have a limited number of participants. So stay tuned to this page to find out more. ODR will be raffling away great prizes including (not limited to) an SUP, a Garmin Watch and the chance to get free registrations to all our races in 2019! Friday, September 7th (from 12pm - 7pm) at the Road Runner Sports Sterling Store. Algonkian Elementary School is putting on the 2nd annual ALG Rough and Tumble to raise money for Autism Awareness! Saturday, April 21st (from 12pm - 4pm) at the Road Runner Sports Sterling Store. The ArcticHalf (renamed from the Arctic Dash) is the perfect trail running race. The Potomac river provides scenic views as you go along the course. Starting from the main pavilion at Algonkian Regional Park (by Volcano Island), the participants will run along the Potomac Heritage Trail and back for a great outdoor cold-weather adventure. The trail is completely tree-lined with some exposed roots and a good mix of dirt and paved paths. It will be a cold weather run, so be prepared with warm gear. We will be handing out hand warmers and we hope to have a roaring fire! T-shirts, Half Marathon Finisher Medals and raffle prizes will be provided. Friday, Febuary 23rd (from 12pm - 7pm) at the Road Runner Sports Sterling Store. We will have prizes for first place winners M/F. If you want to have a better chance at winning a prize take a look at our Participant Sponsorship page. Get your friends and family to sponsor your cause and you could take home the Grand Prize! The SUPERFLY has been postponed until a TBD later date. Thanks for your interest. The first ever isometric endurance course offered by Old Dominion Racing! The SuperFly 5k is a course that includes staging areas where participants will be judged on two isometric exercises (Burpees and Planks). Participants will be required to run a 5k race. During the 5k there will be two stops where runners will stop and perform two isometric exercises. The runners will perform these exercises for as long as they can. ODR will measure the duration (not count of repetitions) for which each participant has performed. These durations and the length which it takes the runners to complete the 5k, minus the duration of time spent on the isometric exercises, will all be considered to identify the ranking of the participants. All participants will receive a t-shirt, and there will be prizes and a raffle. Packet pickup will be TBD from 8:30am until the race begins at 10:00am @ the race start in Lake Fairfax Park Pavilion K.
There will be a Runners Yoga Stretch that starts at 9:30am. This race is 95% on paved and shaded trails! It starts in down town Herndon, on the town green (@ 777 Lynn St. Herndon, VA). This year the HerndonHalf is a there and back again race. First traveling up the W&OD trail, then the race goes along a short portion of Herndon Parkway and up Folly Lick Trail, across into Sugarland Run Trail and then back the way you came. Packet pickup will be on Sept 22nd from 6pm-8pm and on Sept 23rd from 6:00am-7:15am (both in front of the W&OD Caboose next to the town green). There will be a Runners Yoga Stretch that starts at 7:00am to 7:15am. The race will start at 7:30am. Each race will be staggered so that everyone can enjoy the end of race festivities. Algonkian Elementary School is putting on the first ever Rough and Tumble to raise money for Autism Awareness! We will be staggering the races, starting with 5th graders at 10:00am, and all other grades will follow at 15min intervals. Parents are encouraged to participate with their children and are welcome to run the course during their children's allocated race times. Come out and support your favorite PTA/PTSA/PTO/BOOSTER! 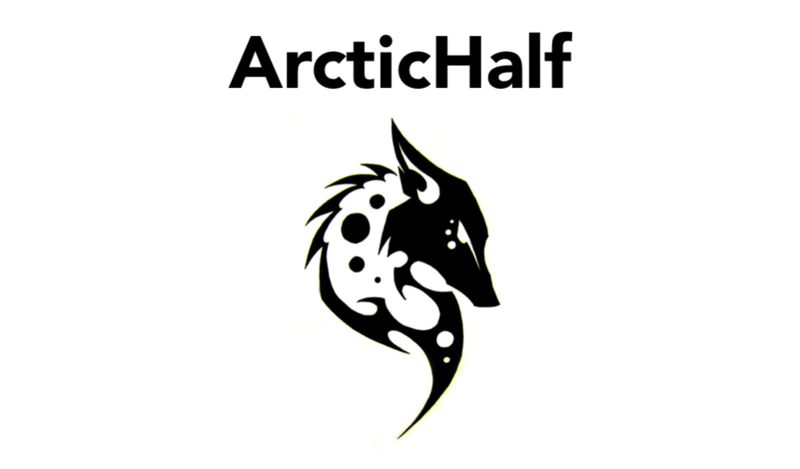 The Arctic Dash has been renamed to the ArcticHalf. 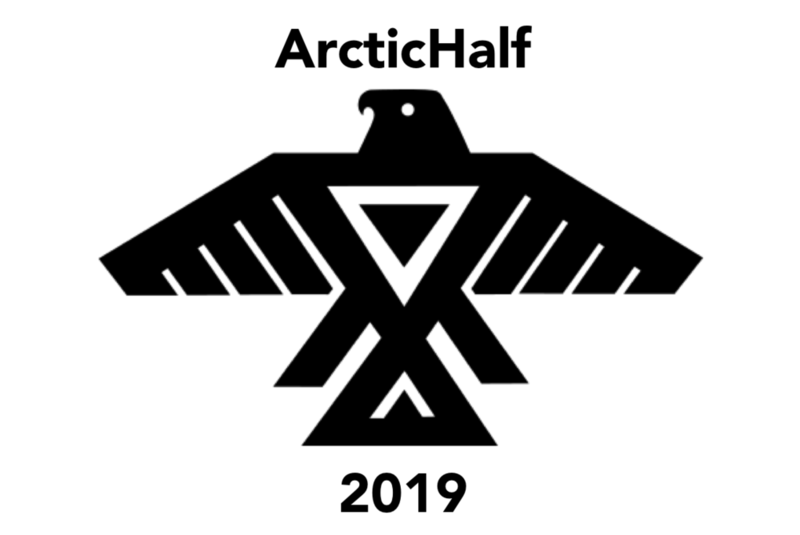 Please follow this link to get more information about the ArcticHalf 10k/5k/1k - 2018. The Arctic Dash is the perfect trail running race. Starting from the main pavilion at Algonkian Regional Park, the participants will run along the Potomac Heritage Trail and back for a great outdoor adventure. The races will start at 11:30am from the Algonkian Park pavilion 1 (next to Volcano Island). It will be a cold weather run, so be prepared with warm gear. The yoga stretch will start at 11:15am, so come out and join the warm up! We will be staggering each race so that as many participants as possible can be present for the after-race festivities. The 1k race will take place during the festivities, after all other races are completed. Children under 12 participating in the 1k and 5k will be required to be accompanied by an adult during their run. *The amount provided to each PTA/PTO/BOOSTER/PTSA is 50% of profits divided up based on a proportion of the number of participants (and the amount each participant pays) that select that particular school at time of registration. Please contact daniel@olddominionracing.com for any questions. This is the first annual HerndonHalf Marathon, 12k, & 5k. This race is 95% on paved and shaded trails! It starts in down town Herndon, right in front of the Old Town Hall. The HerndonHalf makes a big loop, traveling up the W&OD trail to Sterling Blvd and back down to Ferndale Road. 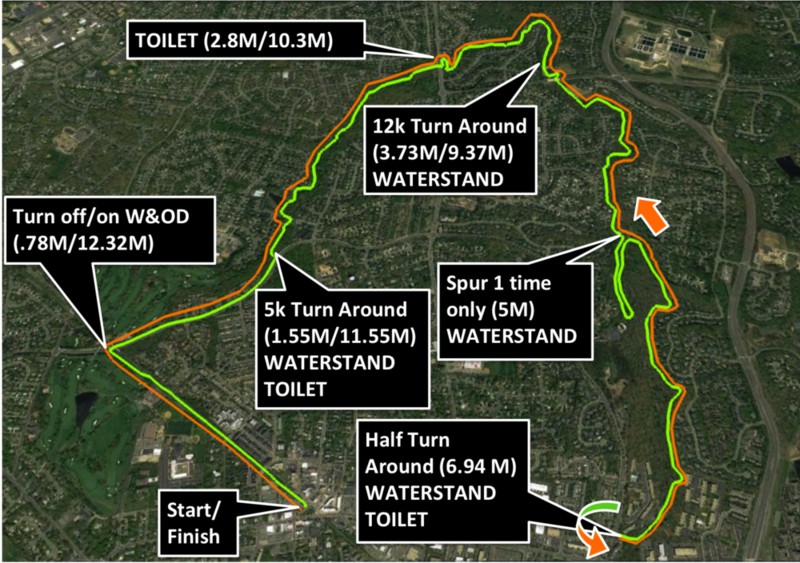 Then the race goes along a short portion of Herndon Parkway and up Folly Lick Trail, across into Sugarland Run Trail and then back onto the W&OD. It finishes back in front of the Herndon Old Town Hall. Packet pickup will be on Sept 16th from 6pm-8pm and on Sept 17th from 6:30am-7:45am (both in front of the Herndon Old Town Hall). There will be a Runners Yoga Stretch that starts at 7:30am to 7:45am. The race will start at 8:00am. *PLEASE BE AWARE THAT THE HALF AND 12K TRAILS CROSS OVER A STREAM IN SEVERAL LOCATIONS USING PYLONS (high clearance strollers recommended).